Does anyone else feel like January dragged on and on? Most of the time months seem to fly by, but that wasn't the case for January. The month of after-Christmas, of going back to work, of making lists and goals, of eating less... it's just not one that passes in the blink of an eye, at least I don't think so. So I'm feeling ready for February in all its short-month glory. At the very least, we're one month closer to spring. Hearting: My local blogging community. I feel very lucky that I live in an area with such an awesome group of bloggers. The KC Blogger Meetup group just put on an event last week at Roots and Branches Salon in Kansas City, and I had a great time reconnecting with bloggers I'd met before and meeting new friends as well. 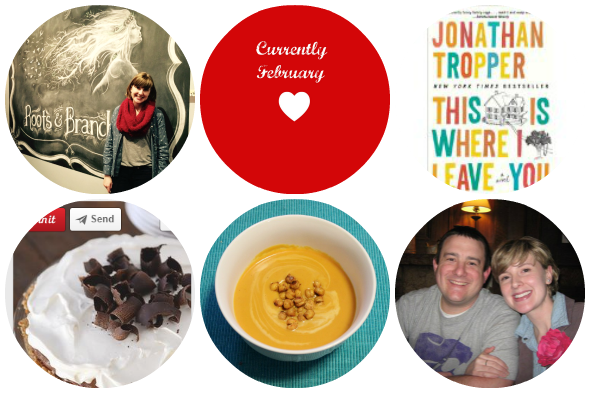 Reading: This is Where I Leave You by Jonathan Tropper. It's the story of Judd, whose father passes away and his dying wish is for his family to sit Shiva after his death. So Judd and his entire dysfunctional family are forced to spend seven days together in one house. That's bad enough, but Judd is newly single after catching his wife in bed with his boss, and on the day he learns of his father's death he also learns that she is pregnant. Good day for Judd. (I promise I'm not ruining anything here, I just started this book and learned all this at the beginning.) Despite the depressing circumstances, this book has made me laugh out loud several times; the writing is fantastic. Pinning: decadent desserts. After all the baking and eating I did over the holidays, I didn't do quite as much indulging in January. But I feel as though my sweet tooth has had enough of a break, so I've been in the mood to do a little baking once again. Eating: Soup. The weather has been a little all over the place, but even on the milder days I've craved soup lately. Some good ones that we've tried are sausage and potato soup, tomato basil soup with tortellini, and butternut squash soup with chickpeas. One soup that's on my to-make list is this slow cooker thai chicken soup from Foodie Crush. Anticipating: Valentine's Day date night. This year Aaron and I decided that we need to make it a priority to have date night once a month. Life gets busy and we get into our routines, and it's not always easy to get out, you know? But once a month is definitely doable, and we really need that quality time with each other. Now I'm not one to make a big fuss of Valentine's Day, but I do like doing something special, even if it's just going out for dessert. I'm not sure yet what we'll do, but we already have the babysitters (aka grandpa and grandma) lined up. Linking to Currently at In Residence and Dearest Love. I wish I had a better group of bloggers near me. I know there's a group of MN bloggers but I've never been able to get into that clique. I guess I have to settle for the online group I have! Thanks Melanie! That's my goal--to write it down so I'm more productive. Let's hope I can keep it up! Wow that's a lot of soup...sounds wonderful!! I think I've seen some of those pics on Instagram :) You'll have to send me your recommendations! I have made soup 7 times in the past two weeks. It's so perfect for a quick and comforting meal!! That butternut squash one sounds delish! I need to make more soups, it has been so cold here lately and it just sounds good! I will have to check that book out, it sounds like a good read! And we're totally trying to do the once a month date night out thing too - we do our weekly date night at home, but we agreed we need to get out and do things too! I hope you have fun on yours! It's so good, I can't put it down. Definitely recommend it! Thanks Beth! I love your weekly date night in idea too, I think it's good to have a balance of both stay-in and go-out dates! This is Where I Leave You also made me laugh out loud. I've heard the movie isn't as good, but I still want to see it. Good for you for making it a date night. I hope you two have fun! I heard that too, but I want to see it too once I finish the book (which I can't put down--soo good!). Thanks Megan! soup sounds amazing right now! great thoughts.. enjoying your blog! Thanks Alexandra! Travel does make time go by fast, especially when you're going somewhere fun! And I love that movie--it's been a while since I've seen it but I remember it was really sweet. Thanks Nelle! It's been great soup weather, hasn't it? Oh you should...I love it. I've laughed my way through it, despite the serious circumstances. The writing is just fabulous. And yes, I agree about the planning. Before Jona, Aaron and I were pretty bad about going out on "planned" dates, which meant that real "date nights" were rare (like, we'd end up at home watching Dateline or something...sad). But now, the planning means that we really take the time to spend quality time together, OUTSIDE our house from time to time. Thanks Alexandra!! I think those are great goals, especially cooking. It's sometimes so hard to find time to cook with busy schedules, so that's awesome that you were able to do that! January did seem like such a long month! I'm jealous you have such a great blogging community! I want one! i loved that book but haven't seen the movie! I'm loving it too--almost done!! I do want to see the movie, even though I haven't really heard great things about it. Thanks Jenna! It was really good--even my husband (skeptical of butternut squash) liked it!